MOSCOW — Holding on to the ankles of two of his opponents, Alex, a 33-year-old member of a Moscow soccer hooligan group, felt the blows on his head but wouldn’t let go. The third man on top of him was battering his skull with both fists, but still Alex held on, hoping to buy his teammates, battling around him, breathing space. At last, the man rammed his elbow down into Alex’s face, shattering his eye socket. He let go. This was not his first fight; years of organized brawls have left Alex with a face reshaped by blows. (Surgery and a plastic implant stabilized his eye after this most recent one.) And that last fight, nearly a year ago, had been a good one, Alex said in a recent interview. His side had won. What had unnerved him was a new feeling: He realized it was getting harder to keep up. When it first appeared in the 1990s, hooliganism in Russian soccer modeled itself heavily on the English version, adopting its clothes and terminology, including the term for its groups: firms. The Russians also embraced the English’s passion for blackout drinking and drunken brawling. In fact, Russia’s hooligan scene has undergone a transformation. The new generation bears little resemblance to the beery bravado and off-balance punch-ups associated with traditional European hooliganism, or even the sometimes militialike violence of South American ultras. Instead, the fans who have emerged in Russia over the past decade are obsessed with physical fitness, elite martial arts training and — at least while fighting — militant sobriety. Christened Okolofutbola, or “around football,” Russia’s hooligan scene has developed into perhaps Europe’s toughest, and just over a year before their country hosts soccer’s World Cup, the most hard-core Russian fans may be in the best fighting shape of their lives. But while their prowess is not in doubt, fan monitors, soccer officials and even the hooligans themselves say there is virtually no chance the disorder that the Russian fans brought to last year’s European Championship in France will be repeated on home soil. Instead, Russia’s hooligan groups are enduring an unprecedented crackdown by the authorities, who are determined that the World Cup will go smoothly. Interviews with more than a dozen fans and hooligan group members over the past five months have shed light on a wave of arrests and searches that have targeted the most violent fans and their leaders, as the police have turned measures more associated with antiterrorism operations and political repression against the hooligans. In Marseille in June, it quickly became clear the Russians had come to fight. Thousands of English fans had packed the Old Port of the southern French city ahead of their team’s match against Russia at the European Championship. The English — many of whom had been drinking for three days — had occupied the waterfront’s cafes, from where some occasionally lobbed objects toward French riot police officers standing watch. The Russians, meanwhile, had landed in Barcelona, Spain. There they boarded buses for France, identifying one another by singing Russian punk songs. Arriving in Marseille, they received text messages with instructions on where to gather. Without even stopping to drop their luggage, most headed straight for the English. The Russians hit the English like a cavalry charge. In minutes, the port was a battlefield, with fans clashing under barrages of flying bottles and pinwheeling chairs. About 200 Russian fans, many wearing masks and mixed-martial-arts fighting gloves, loped through the chaos, capturing their actions on GoPro cameras strapped to their bodies. The violence continued in the stadium that night, when hundreds of English fans and neutrals were forced to scramble away from another Russian charge. The chaos left 35 people injured. While the English also had clashed with the police, resulting in a half-dozen arrests, most observers were transfixed by the Russians’ more efficient violence. The Marseille prosecutor, Brice Robin, described the Russians in almost military terms, telling reporters that they were “well trained” and “ready for hyper-rapid, hyperviolent operations.” The French police expelled 50 Russians — at least one fan leader sneaked back into the country and had to be deported a second time — and European soccer’s governing body, UEFA, fined Russia’s federation $170,000 and issued a suspended threat of disqualification for its team. Hanging over the entire episode, though, was a frightening new question: Would visiting fans risk attack from crack squads of hypertrained hooligans at next year’s World Cup? That some state news media outlets and government officials in Russia appeared to encourage, or at least condone, the violence sowed further doubt. The fans’ evolution tracks larger movements in Russian society. A trend toward martial arts and fitness generally — partly promoted by the Kremlin and President Vladimir V. Putin, a trained judoka who is proud of his sporting image — has spread to fan circles. At the same time, Russia’s security state has reasserted itself, driving hooligan violence underground. On a recent evening, two dozen young men gathered in a stylish Moscow gym. Wearing skull masks to shield their faces, they went through a warm-up before fighting practice bouts in boxing and wrestling. “It’s all on a different level now,” said Yevgeny Berezin, who led the session. Berezin fought in organized brawls for 10 years but recently stopped, he said, to focus on acting. The participants are diverse — construction workers, information technology managers, fitness trainers — but the most active consider themselves elite fighters with an honor code. They insist they would never attack ordinary fans, only other hooligans. He and others attributed the attacks on the English in Marseille to overenthusiasm, noting that the Russian fans there were not from top firms — they were young regional groups at their first big tournament. Particular pride is taken in fighting exclusively bare-knuckle. 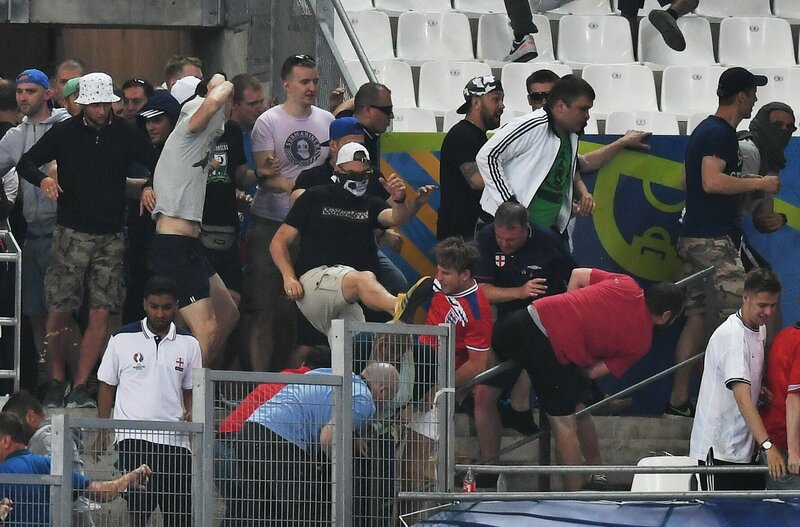 Ultratrained hooligans have appeared in other countries — notably Poland and Germany — but only in Russia is it seen as having become entwined with the national character. Its supporters also point to the similarities of the fights in the woods to an old peasant game known as stenka na stenku, in which two villages would square off during festivals. For some, organized hooliganism has become a sort of primal expression of uninhibited Russian masculinity, and it appears peculiarly suited to a moment when the Kremlin is cultivating the idea that Russia must rely on its strength alone in its opposition to a bloodless, overcivilized Europe. After Marseille, Putin himself wondered aloud how “200 Russians could thrash several thousand English.” It was perhaps this context that led to an unlikely proposal recently by a Russian politician to make hooliganism a sport. Lebedev’s proposal prompted horror in Europe, but it perhaps more reflected an increasing government effort to separate Russia’s hooligan scene from soccer. Last spring, a brawl between Moscow’s two top firms resulted in house arrest for five fans, including a firm leader. The men face jail time — an unusually harsh punishment for such a fight. The arrests spooked the fighters, as more detentions followed, as well as frequent searches of fans’ homes. Fans interviewed by The New York Times talked of receiving visits from armed police officers, and of telephone calls warning them that they are being watched. In September, Russia’s national supporters’ club, which represents fans, was shut down, while its chief, Aleksandr Shprygin, was arrested and briefly held in connection with the same brawl. The next day, Shprygin’s car was set afire by arsonists. The closing of the fan club, which presaged Shprygin’s arrest and arson attack, was viewed as a punishment for his championing the Russian fan violence at the European Championship in France.